On our recent trip to Xi’an, I was exposed to the last frontier of China. On the outskirts of Xi’an around Qingyun Ma’s Jade Valley Winery, small clusters of dilapidated houses and a vast, green patchwork of farmland covered the landscape. I was in agruarian China, right at the cusp before development. Next to the clusters, I could see the construction of a new school and a small town center starting to take form. This experience of being away from the city was a relief, but for the people who lived there, this was their everyday life. For cityfolk like me, anything beyond the city that I did was a spectacle, or even absurd. In Henri Lefebvre’s Everyday and Everdayness, he sees the world destroying diversity and working towards uniformity. He stated that “Every complex ‘whole’ from the smallest tool to the greatest works of art and learning, therefore possessed a symbolic value linking them to meaning at its most vast: to divinity and humanity, power and wisdom, good and evil, happiness and misery, the perrennial and the ephemeral. These immense values were themselves mutable according to historical circumstance, to social classes, to rulers and mentors. Each object was thus linked to some ‘style’ and therefore, as a work, contained while masking the larger functions and structures which were integral parts of its form.” However, because the “functional elements was itself disengaged, rationaled, then industrially produced, and finally imposed by constraint and persuasion: that is to pay, by means of advertising and by powerful economic and political lobbies” these everyday items have lost their “essence.” We have been numbed by society to not see differences and be curious about the world. Our class had to take cars to visit Dean Ma’s father’s house and one mode of transport was in the back of a pickup truck. Riding on the back of a pickup truck in America is different than riding it in the Xi’an countryside even if the pickup trucks were the same. With my conditioned mode of thinking, I have rationalized that its dangerous and the police would not hesitate to issue me a ticket for such ridiculous behavior. But in Xi’an, I wanted to ride the back of the pickup truck because there were no such thing as rules to govern me. I was responsible for my own injuries because it was my decision to ride in the back of the pickup truck. For the people living in the Xi’an countryside, people ride in the back of trucks all the time. Society has conditioned me to think that riding anywhere besides the passenger seats is considered unsophisticated and dangerous. 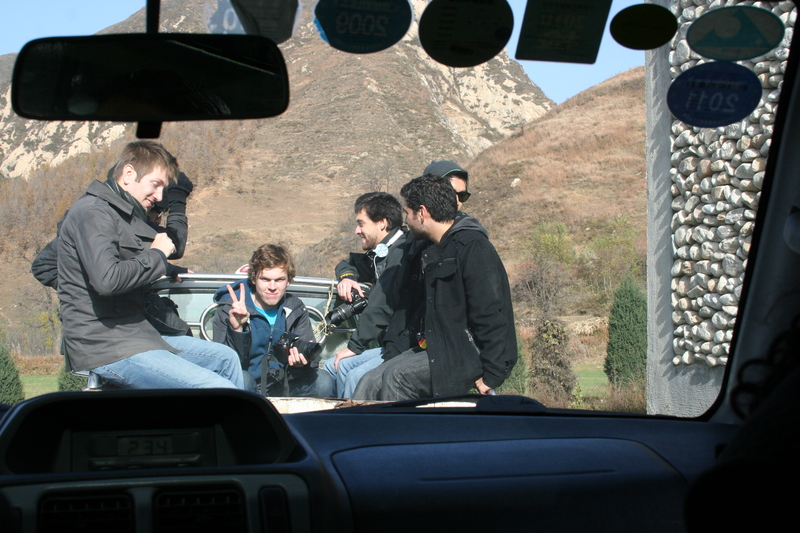 Most of my classmates and I WANTED to sit in the back of the pickup truck because we could break free from society’s constraints and enjoy the Xi’an countryside in an absurd, but memorable way. Our bickering to ride in THAT pickup truck in THAT setting subconsciously justified our appreciation and desire to experience the everyday. This event reminded me of the film Weekend because it extremitized the everyday by making it completely ridiculous and because of its absurdity, thus making events more memorable. One particular scene filmed a traffic jam with cars set ablaze and dead bodies sprawled, but some people have casually parked their cars having a picnic, or running around. At the time, I was thoroughly confused and thinking “WHAT THE HELL IS GOING ON”, but those emotions and thoughts jolted me out of my complacent mindset of what a movie should be. But does the absurdity of the everyday imply that it’s impossible to occur? I would argue that it is more improbable than impossible that the absurdities occur, especially in a desensitized world today. But when noticed, they give me a jolt of excitement that I immediately want others to also see. 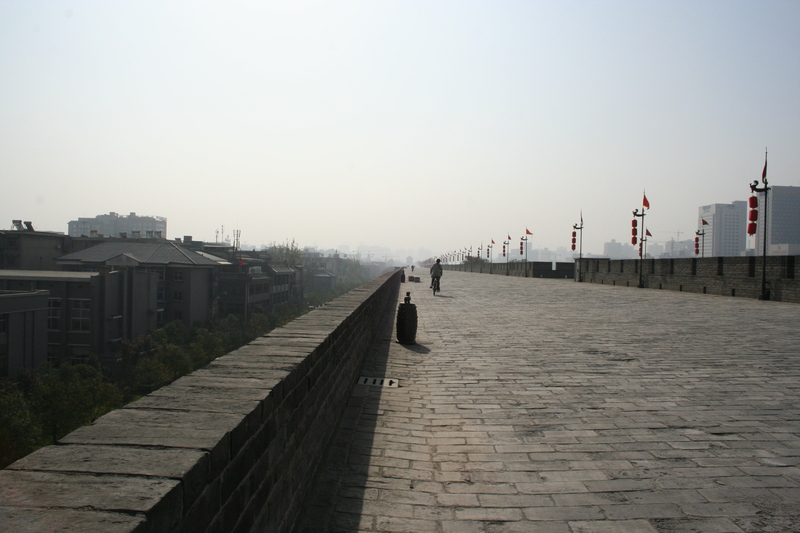 Back in the city, I visited Xi’an’s city wall. The width of the wall was wide enough for charriots to pass through, and now as a tourist attraction, visitors can ride a bicycle along it. After recently watching Beijing Bicycle, this strange coincidence came full circle. In the movie, the bicycle becomes takes on a character because the movie shows it being more than it is. For one character, the bicycle is a dream to have, enjoy, be cool and to attract a girlfriend. The other character values the bicycle because it is his way of making a living delivering packages. Both become attached to the bicycle that stir a range of emotions like sadness, courage, fear, and worry. The bicycle transcends its normal meaning of transporting a person from point A to B. Seeing the Beijing Bicycle and Weekend helped me understand that I was not just riding a bicycle. I was riding it on a relic and ancient artifact of the city. I was seeing the roofscape of the buildings inside the city wall. I was seeing the new skyscapers just outside of the city wall. Riding a bicycle on the street would not have given me this same experience [nonetheless riding a bicycle in a country that doesn’t give the pedestrian the right of way is another expierence]. The meaning of this bicycle went beyond just riding it, but all the other sights that came about after I started pedaling. I am ashamed of the fact that I have been numbed by society and blinded to see the excitement and beauty around the city. Now that I notice that simple things that occur in the city as part of the everday experience, the city is not just a place where I inhabit. It is a larger, living organism that has varying scales of activity that my curiosity allows me to see.